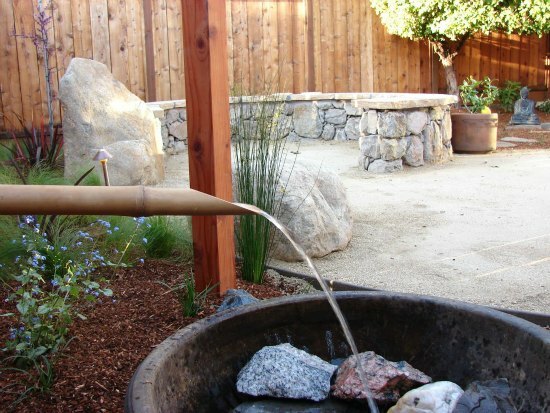 Garden water features appeal to your senses and nurture your spirit. Flowing water will add dynamism to your landscape design, while a reflecting pond will mirror the sky and surrounding vegetation of your garden. Whether you choose a meditative pool, a dancing waterfall, or an overflowing urn, a water feature will enhance your outdoor experience and unify your garden. At Sarah Ray Landscape Design, we specialize in: containers, dry creek beds, fountains, meditative pools, ponds, streams, and waterfalls. Small amounts of water have a soothing effect. 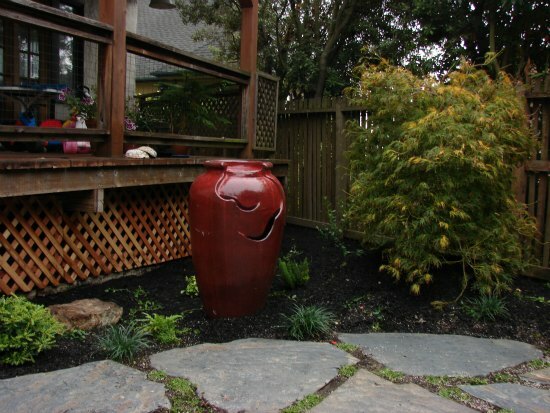 Container garden water features work in any space no matter the size. Even the smallest property can be a personal Eden with the addition of a ceramic urn or iron sculpture spilling over with water. An overflowing stone basin can evoke a wistful sense of Eastern cultures and inspire a meditative atmosphere. Barrels, bowls, and tubs invite you to enjoy your tranquil outdoor living space. Dry creek beds create a sense of moving water while emulating the natural landscaping action that water creates with sand and stone. In the rainy season, this feature will redirect excessive runoff while adding beauty to your garden. Fountains can spray water into the air or send it tumbling over an edge. The magical sound of a splashing fountain enhances the wonder of being outdoors while masking neighboring noises. A fountain, which brings life and motion to your garden, can be a centerpiece or a subtle accent to your outdoor living space. Of all the garden water features, the one that provides a perfect antidote to the stress of modern life is a meditative pool. Reflecting the sky above, a still body of water invites tranquil reflection and quiet contemplation. The pastoral tranquility of a garden pond will bring life to your yard while adding visual depth to your property by reflecting sky and scenery. In addition, a pond can serve as a natural gathering place for your family and friends. We create both formal ponds set in hardscape, and informal pools that blend into your garden. Moving water is irresistible to watch and comforting to the soul. 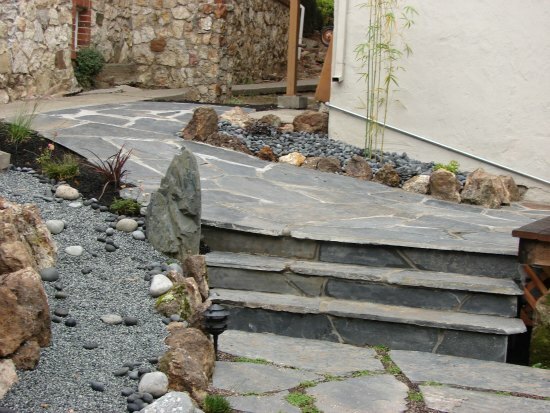 A stream created with rocks that seem to be placed randomly will give the appearance of a natural spring in your garden. The splash and glitter of water tumbling over stone and rock falls brings visual and auditory excitement to your property. Birds will gather on bubbling boulders to drink and bath. Our custom made waterfalls blend naturally with your garden while dramatically enhancing the experience of your outdoor living space. 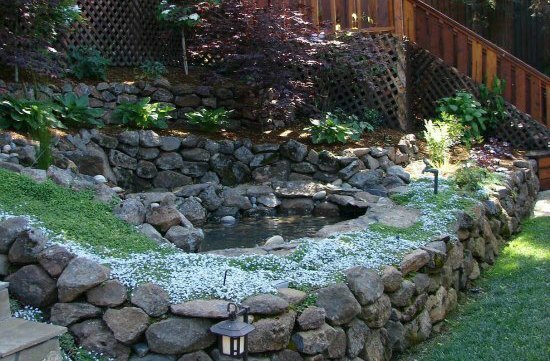 Ponds and water features are ideal for making your garden come alive. Whether it is the soft splash of a fountain, an overflowing container, or a rambling stream, water can give your garden all the tranquility or dynamism you desire. Pond plants can do the work of mechanical pumps, filters, and fountains.